You spend a lot of time maintaining your commercial property. 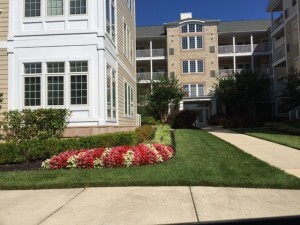 You spend a lot of time maintaining your commercial property, and you want your landscape to be beautiful, professional, and interesting with great curb appeal. You want it to stand out against other landscaping in the area, and the best way to do that is with lots of colors. That’s all well and good in the spring and summer, but how do you maintain a colorful landscape year round? Start by creating a list of flowering plants, arranged by the season they flower in. Most plants, trees, and shrubs flower in the spring, so you’ll have lots of varieties to choose from for that season. Do your research and find a hearty flower, like roses, that blooms despite the summer heat, and intersperse it with the spring bloomers. Next, decide on a nice autumn bloom, such as chrysanthemums, to mix into your landscaping. Finally, see if there is a seasonal flower for winter blooms that will survive in your area. Ideally, these plants should all be able to grow together, so you don’t have to change your landscaping each season, however that may not be possible, or they may at best be annuals, and you will have to replace them each year. Trees and shrubs are a great, often forgotten way to add color to your landscape, especially in fall and winter where the weather is harsh. In the fall, the changing leaves of deciduous trees will add orange and red to your beautiful landscaping. Then in winter, a perennial like pine will offer a pop of green against the snowy landscape. If your landscaping is out of reach from walking paths, consider a holly tree, which will offer the same green but also a pop of red berries. Other season varieties, like poinsettias, could be interspersed in pots for the winter holiday season. If you don’t want to rely just on blooms and leaves to add color, consider colorful hardscaping instead. A brightly painted fence, highly pigmented mulch, or even colorful gravel in the path are all fun options for adding color through hardscaping. Natural-toned hardscaping, like boulders, can also increase the visual appeal of your landscaping. Even though they don’t add color themselves, they provide great contrast so that colorful blooms are more prominent. Outdoor lighting can be used to accent or highlight specific elements of your landscaping. It can also be used to add color. Putting color filters on lights can add soft shades of seasonal color to your green foliage. This entry was posted on Friday, August 31st, 2018	at 8:14 pm	and is filed under Landscaping Design	. You can follow any responses to this entry through the RSS 2.0	feed. Both comments and pings are currently closed.